Sometimes called healthy milk shakes, smoothies first became popular in the 1960s when American health food stores and ice cream vendors began offering this refreshing frosty drink. 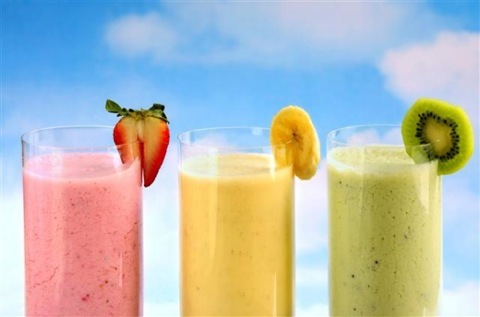 And while it is possible to load up a smoothie with as many calories as a milkshake, they are usually made with low fat yogurt and a dizzying - and nutritious - array of fruits, veggies and nutritious ingredients. Perfect for a midday snack or even a whole meal replacement, if you haven't made your own smoothie yet, pull out a blender and start the fun. Mango is sometimes referred to as a super fruit. It is rich in potassium, Vitamin A, Vitamin B-6, Vitamin C and pre-biotic fiber. This juicy fruit also contains antioxidant properties; recent trial studies indicate that it may even afford protection against certain types of cancer. Even better, its sweet flavor holds just a hint of tartness. As for the added touch of cardamon, this stimulating spice is a detoxifying agent which also helps relieve stomach acidity and gas. You however will only notice how refreshing this fruit & dairy smoothie tastes. Place the first four ingredients in a blender. Process until smooth. Add 1 cup of ice cubes. Blend until crushed and smooth. Don't imagine that a healthy smoothie doesn't also taste sinfully delicious. 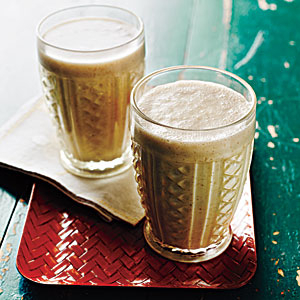 And if you substitute frozen low-fat yogurt for the regular yogurt and throw in a 1/2 cup of crushed ice, the following recipe will taste like a peanut butter and banana shake -- but with a lot less calories and fat. So enjoy. Place all ingredients in a blender, then process until smooth. If the smoothie mixture seems too thick, simply add 1-2 more tablespoons of milk. 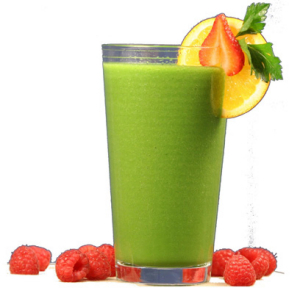 Green smoothies should be made with organic vegetables and fruits. For the best consistency and biggest nutritional punch, it's recommended that a green smoothie's ingredients be blended from 50% veggies and 50% fruit. Called the powerhouse of smoothies, this drink is an easy and effective way to get all those vitamins, minerals, and anti-oxidents into one tasty meal. And a big dose of fiber too. Especially if you throw in flaxseed, raw pumpkin or sunflower seeds. When making a green smoothie with veggies, add a banana, avocado or mango for extra flavor and thicker texture. Add water (preferably filtered) to cover all ingredients. Drink immediately to derive the greatest nutritional benefit. Here is another way to enjoy fresh summer cherries. This recipe is so good, you may want to think about buying a cherry pitter to make the prep work go a little quicker. 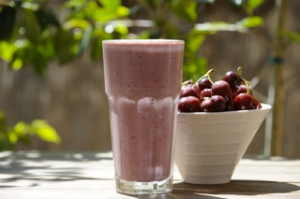 And if you have a taste for cherry smoothies off-season, just substitute frozen cherries for fresh. Combine all the ingredients in the blender. 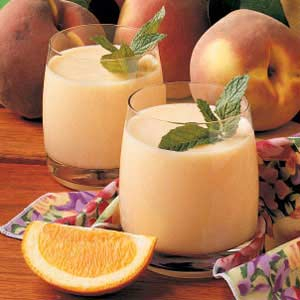 This peach and spice smoothie is not only a great pick me up, but it's also a great addition to any weight loss regimen. 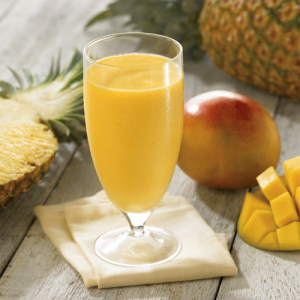 At only 95 calories per serving, this smoothie makes a perfect afternoon snack. As an added benefit, peaches are a wonderful source of beta-carotene, the cinnamon aids flatulence, and the ginger is a perennial stomach soother. Pour the milk, orange juice and grated ginger or ginger juice into blender. Add peaches, cinnamon and ice. Before hitting the gym, try whipping up an Australian smoothie. Its all-natural fruit sugars will give you that burst of energy perfect for revving up your workout. 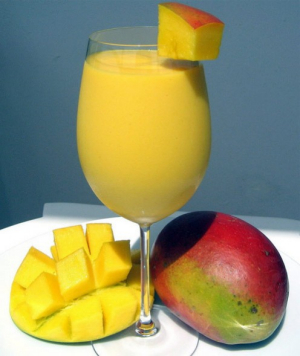 Place the passion fruit, mangoes, pineapple juice, banana and nuts in a blender. Serve immediately. If desired, garnish with a slice of fresh pineapple. No need to spend all that money for an iced coffee drink at the local espresso cafes. 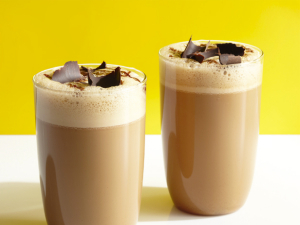 All you need for a basic coffee smoothie is brewed coffee, milk, ice and a sweetener. For a little extra flavor, add any of the following: a tablespoon of chocolate syrup, half a frozen banana, a dash of ground cinnamon, 1/4 teaspoon of almond or coconut extract, 1 teaspoon instant coffee, 1 teaspoon honey or 1 tablespoon instant vanilla pudding. You can also substitute vanilla ice cream or frozen vanilla yogurt for the milk (which is how Starbucks makes it). Place all ingredients except sweetener into a blender. Blend until smooth. Add sweetener to taste, blending once again. Pour into a glass. Top with whipped cream, shaved chocolate or cinnamon, if desired.